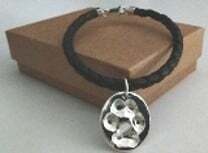 If you prefer leather, you can have your furry loved one's pawprint pendant attached to a bracelet of leather cord. The bracelet length is customized to fit your wrist. Pictured: A small imprint oval pendant on braided black leather cord.